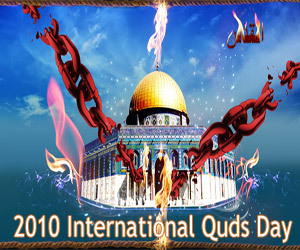 Quds Day is an Islamic day and a day for a general Islamic mobilisation. I hope that this event will be the precursor to the creation of a party for the oppressed throughout the world which will go by the name of the party of the oppressed. I hope that all the oppressed will join this party to remove the obstacles that lie in their path; that they will rise up against the oppressors and plunderers of the East and West and no longer allow oppressors to tyrannize the weak of the earth; that they will make a reality Islam’s proclamation, Islam’s promise which is that the weak will rule over the oppressors and will inherit the earth. Hitherto, the oppressed have been disunited, and nothing will be accomplished by disunity. Now that an example of unity among the oppressed has materialized in the Muslim lands, this must find reality more extensively among all strata of mankind throughout history under the name of the ‘Party of the Oppressed’ which is the same as the ‘Party of God’ (Hizbullah). And it is in accordance with the will of God the Blessed and Exalted that the oppressed must inherit the earth. We invite all the oppressed of the world to join the Party of the Oppressed and solve their problems together with a firm determination and a common will, and through this party, remove any problem which arises anywhere in the world and for any nation. Imam’s remarks dated 18 August 1979 (27 Murdad 1358 AHS). Sahifa-yi Nur, Vol. 8, p. 250.